Justin Louis wears light blue high top Converse “Chuck Taylor” All Stars in the film. Vicky and Craig hold hands between classes. Hello Mary Lou: Prom Night II starts out as a flashback to the year 1957. Mary Lou Maloney (Lisa Schrage) is the most popular girl at Hamilton High School. But Mary Lou has a crude and wild side to her, which we first see in a opening scene where she goes to confession and admits her many sins to the priest. Not contrite, Mary Lou is proud of her sins, and using her lipstick leaves her phone number with the inscription “for a good time” in the confessional booth. The film then moves on to the senior prom, where we see Mary Lou named prom queen. Mary Lou’s promiscuity surfaces again at the prom, when she dumps her straightlaced boy friend Bill Nordham (Steve Atkinson, Michael Ironside) to have fun with Buddy Cooper (Robert Lewis, Richard Monette) one of the school’s “wild crowd.” Furious, Bill decides to get revenge on Mary Lou as she is being crowned queen by dropping a stink bomb on her, but the burning bomb accidentally catches her dress on fire, and burns her to death. The film then fast forwards to 1987. Bill Nordham is still hanging around Hamilton High, but now he is the principal and the parent of a son Craig (Justin Louis) attending the school. Craig is attracted to Vicki Carpenter (Wendy Lyon) who is involved in school activities and a likely candidate for prom queen. The two plan to attend the prom despite the opposition of Vicki’s strictly religious mom Virginia, who thinks that such things are a waste of time. Vicki’s parents barely give Craig the time of day, and refuse to give her any money to buy a dress for the prom. Desparate to find something to wear, Vicky goes to the prop room in the high school theater department and finds an old trunk that contains a beautiful purple dress and tiara, just what she needs for the prom. What she doesn’t realize is that when she opened the trunk, Mary Lou’s spirit was unleashed. 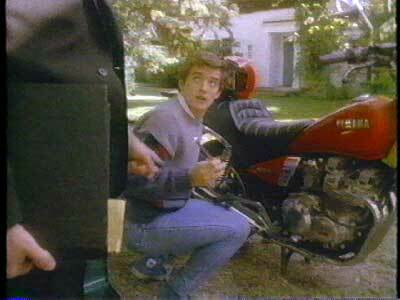 Craig works on his motorcycle while Father Cooper goes to meet with his father. The spirit soon begins wreaking havoc on the student body, killing one of Vicki’s friends, and terrorizing Vicki’s friends. We also discover that Mary Lou’s wild boy friend Buddy is now a priest, determined to make up for his past transgressions with Mary Lou. Gradually Mary Lou’s spirit takes over Vicki’s body and her personality changes from virginal high school student to promiscuous party girl. Vicki begins to see disturbing visions of blood, evil, and lust, and soon she cannot no longer prevent Mary Lou from completely taking over her body. Vicki starts talking, dressing and acting like Mary Lou, complete with fifties slang. Bill Nordham and Father Cooper become aware of Mary Lou’s presence, but there is nothing that they can do to stop her spirit. When Father Cooper warns Bill Nordham about the impending danger, he refuses to take it seriously. Things come to a head as the senior prom approaches. Will Mary Lou be successful in getting her revenge? The balance of the film is about these strange happenings and events that happen to Vicki and her friends. Vicky and Craig in the halls of Hamilton High. Although Hello Mary Lou: Prom Night II was released as a sequel, it really doesn’t have much relationship to the original film, which was a slasher movie. This film reminds you more of evil possession movies like The Exorcist and Carrie. Director Bruce Pittman keeps the action moving, and the special effects are pretty good considering it was made in 1987. There is a lot of sardonic humor in some of the writing, and especially in the death scenes that reminds you of a good Vincent Price film, like one of Dr. Phibes series. There’s even a great “mummy” scene! Wendy Lyon gives a strong performance in her split personalities, a female Dr. Jeckel and Mr. Hyde tour de force. Other than Vicki we don’t see a lot of plot or character development, but then what do you expect from another prom night horror flick? Certainly worth a look if you like this genre of film. Craig tries to fend off the spirit of Mary Lou. 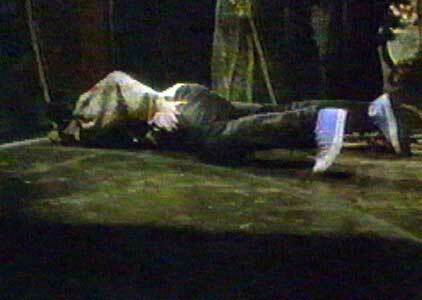 Craig falls down back stage at the high school prom. Justin Louis in his role as Craig Nordham, Vicki’s boy friend and the son of Bill Nordham, the high school principal who was jilted by Mary Lou at the prom, is seen wearing light blue high top chucks throughout the film. There are some good camera shots of them in most of the scenes he is in, and you even see him wearing them at the prom, due to some plot circumstances. Louis reminds you of a grown up Andy (from Child’s Play 2), a little bewildered by all of the turmoil and strange happenings that suddenly come into his life from an evil spirit. Probably the best chucks scene is when he is trying to escape from the possessed Vicki/Mary Lou at the prom, and she tries to tangle him up in some rope. Mary Lou tries to ensnare Craig in some rope. Hello Mary Lou: Prom Night II. (1987) Michael Ironside, Wendy Lyon, Justin Louis, Lisa Schrage, Richard Monette, Terri Hawkes, Brock Simpson, Judy Mahbey, Wendell Smith. Directed by Bill Pittman. Category: Horror.